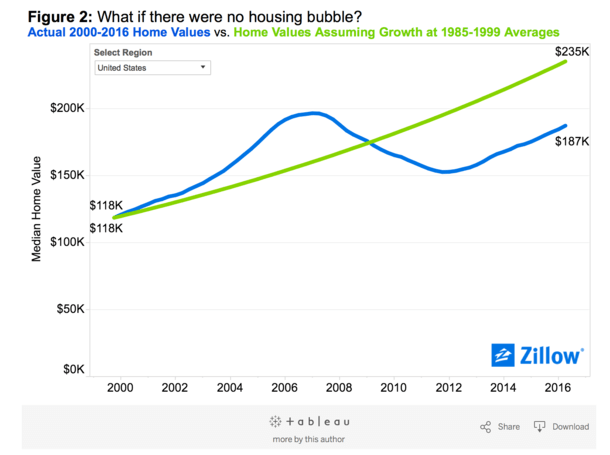 A new analysis from Zillow reveals that many homes would actually be worth a lot more today had there been no housing bubble back in the early 2000s. The basic premise is that historic home price growth year after year would have amounted to better overall gains than a few boom years followed by a bust and then a partial recovery. Of course, home prices don’t just climb steadily over time. They ebb and flow, dip and peak, just like the stock market. So it matters when you buy, though as I’ve mentioned before, time tends to heal all wounds if you stick with real estate long term. However, you might just be better off investing in stocks, which have gained 40% since the bust. Let’s pretend the housing bubble never happened. Instead, let’s assume home prices increased at historic rates year after year. The median home in the United States would actually be worth 26% more today than where it currently stands. Using 1985-1999 home price growth rates, Zillow discovered that the U.S. median home price would be nearly $235,000 today, instead of the actual $187,000. But that’s not how history played out. Instead, home prices surged between 2000 and 2006, and by the first quarter of 2007 the median price was 22.4% higher than its historic growth norms would indicate. That was great news for those who sold at the top, but terrible news for those who purchased a home around that time (or decided to cash out all their equity with an option arm). We all know what happened next – home prices tanked, pushing them well below levels they would have reached had they just appreciated in line with historic norms. Thanks to the subsequent bust, 2000-2016 appreciation averaged just 2.8% nationwide, compared to annual home price growth of 4.2% from 1985-1999. So slow and steady does indeed win the race, it’s just a lot less exciting. While 20 of the 30 largest metros in the nation would have higher home prices sans housing bubble, there are 10 that have shaken off the bubble carnage and surged higher. For example, the median home price in Los Angeles was $572,400 as of the second quarter according to Zillow. 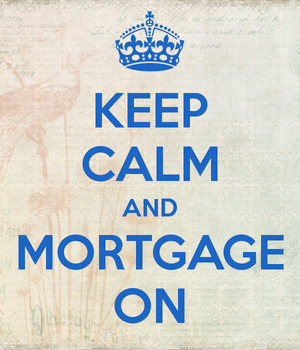 Had we avoided a bubble and just stayed on trend, home prices would be closer to $476,000. The same is true for Washington DC, where home prices are currently around $368,700, but should be around $331,700. Other housing markets that may have overextended themselves include Baltimore, Dallas, Miami, Orlando, Phoenix, Riverside, San Diego, and Tampa. Conversely, some metros that are red hot and seemingly overvalued are actually still well below where they would be had we avoided a major boom. Examples include San Francisco and San Jose, where the median price was $812,300 and $957,900 in the second quarter, respectively. Using historic annual home price appreciation rates of 5.6% and 5.5%, prices should be closer to $935,000 and $1,281,300. The same goes for Denver, where home prices are a staggering 45% above peak levels seen in 2007. The median was $338,500 in the second quarter but should be as high as $374,300. In Chicago, home prices are nearly half what they should be, at just $198,200 versus the $368,100 had they just stayed the course. In Detroit, they’re nearly a quarter of what they should be, just $127,300 versus the $388,000 projection based on historic appreciation. But things don’t operate in a vacuum, nor do home price appreciation rates remain static. Things can change dramatically, as we’ve seen in some hard-hit areas of the country. The economics of certain metros can go through vast and painful transformations. So that doesn’t mean you can just look at where home prices should be and then buy accordingly to turn a profit. Still, home prices nationwide remain 4.9% below peak levels seen in 2007, and are expected to hit pre-Great Recession levels around the end of 2017. Factor in ten years of inflation and record low mortgage rates and it might seem like a decent time to buy a home.